Lock in a great price for The Westin Bonaventure Hotel & Suites – rated 8.4 by recent guests! The facilities were nice and the staff friendly. Our room was clean and comfortable. Location was perfect for my trip, and view from my room was awesome. The breakfast was excellent. I have stayed at this hotel before and like it very much. Location walking distance to Grand Central Market, theaters. Bonadventure is a breath taking hotel. First time there and I loved it. Definitely coming to stay during the summer to enjoy the pool. Beds were comfortable, parking garage staff were very efficient and kind. Concierge’s was very helpful. Amazing view, linens and bed were very comfortable, shower was amazing. Staff was friendly and professional. My room service was excellent - right on time, cooked food was hot, condiments/extras were great, etc. Check in and check out were fast and efficient, and my parked car was returned by valet promptly. Good trip, great hotel; would recommend it to others. The Westin Bonaventure Hotel & Suites This rating is a reflection of how the property compares to the industry standard when it comes to price, facilities and services available. It's based on a self-evaluation by the property. Use this rating to help choose your stay! Featuring a restaurant with 35th floor panoramic views and an outdoor pool, this hotel is within 1 mi from the Grammy Museum, Los Angeles Convention Center, Nokia Theater L.A. LIVE and the Staples Center. Offering floor to ceiling windows, each modern air-conditioned room provides a laptop safe, wake-up service, a spacious desk and free spa toiletries in the private bathroom at The Westin Bonaventure Hotel & Suites. Rooms are styled in earth tones and luxury linens. Starbucks coffee and Tazo tea-making facilities are also offered. A spacious seating area is featured in select suites. While overlooking downtown Los Angeles, gourmet steaks and seafood can be enjoyed at the LA Prime Restaurant at The Westin Bonaventure. Lakeview Bistro and BonVista Lounge feature classic American fare. 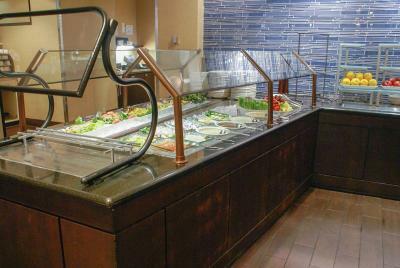 Fresh snacks are featured in the Lobby Court. Dry cleaning services, valet parking, interactive cooking classes and a fitness center are available for guests at Los Angeles The Westin Bonaventure Hotel & Suites. A 24-hour reception is at their service. 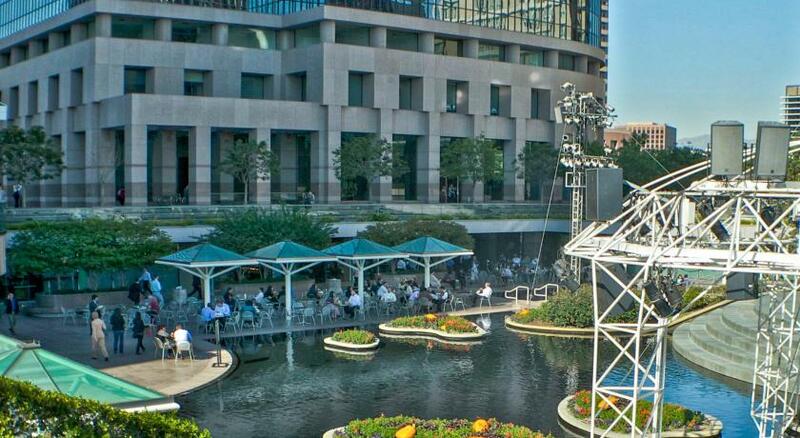 Downtown LA is a great choice for travelers interested in city walks, entertainment and food. When would you like to stay at The Westin Bonaventure Hotel & Suites? Hotel surroundings – This neighborhood is a great choice for travelers interested in city walks, entertainment and food – Check location Great location - show map Guests loved walking around the neighborhood! House Rules The Westin Bonaventure Hotel & Suites takes special requests – add in the next step! Any additional older children or adults are charged USD 20 per night when using existing beds. All older children or adults are charged USD 30 per night for extra beds. The Westin Bonaventure Hotel &amp; Suites accepts these cards and reserves the right to temporarily hold an amount prior to arrival. The Westin Bonaventure Hotel & Suites accepts these cards and reserves the right to temporarily hold an amount prior to arrival. The place in this old condition is not worth these extensively high rates! Upgrade it! The place in this old condition is not worth these extensively high rates! The parking staff were having great difficulty with retrieving the cars and the parking is expensive. Navigating the hotel was not easy and there was not enough signage to figure out how to get from one place to the other. The restaurants in the building did no have good variety but the hotel restaurants were expensive but delicious. Air quality. Kept getting headaches when the air was on for longer than an hour. Please change air filters. Location is a little confusing to get to. Valet parking height is caca. Westin is so far from shopping centers and restaurants. Old and small rooms with low ceiling. Finishes in the hotel were stuck in the late 70's. Needs updating bad. Water pressure was bad in my room. Not enough signage inside as to where restaurants are. I had to make a room change in the middle of my stay because the sound between the adjoining room to room in my own was to clearly heard and kept me up at night. The staff responded very quickly to relocate me. Bed was comfy as always. Love Westin beds!